SWEET UNICORNS. The language we use either lifts us up or brings us way the f&ck down. A single positive word, such as, “YES”, “mo’peace”, and “KALE”, has the power to influence the motivational center of the brain. THAT’S RIGHT. It’s the pretty pink frontal part of our cerbral cortex that builds resiliency, makes us giddy, and helps to conjure up absolute magic. On the other hand, a single negative word increases the activity in the fear center of our brain. BOO. Every time we use mean, stingy, and hostile language against ourselves and others, dozens of stress producing hormones are released that interferes with our ability to make reasonable choices. 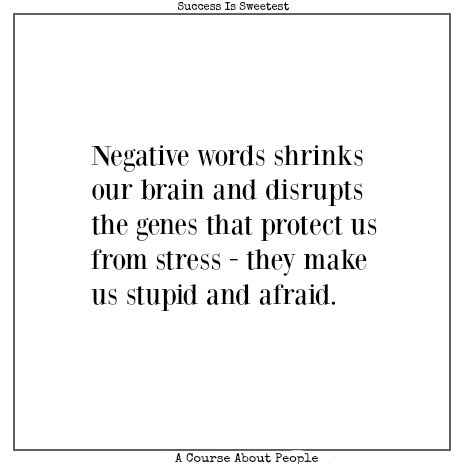 Negative words shrinks our brain and disrupts the genes that protect us from stress; they make us stupid and afraid. So where do you stand? Are you mindful of your words? Do you use uplifting, powerful, feel good language when you set and seek support for your goals? WANDS UP. To make this word thing work, write down what you see as a challenge and not working in your favor. Come up with a gutsy, heart-centered statement, or a single word that epitomizes the other side of each challenge. Follow the rules – (Take the chains off your brain). And make new rules. Hey – ho. YOU(!) just devised a page of highly positive instructions and intentions. || LOVE BOMB || It’s not fixed. And it doesn’t have to be hard. (It takes about 60 seconds). By holding ONE positive word in your mind you can fire-up the frontal lobe activity. Connecting you directly to your inner-life wizard – inspiring and urging YOU, sweet dreamer, to dial up the good life and practice for the really, really good stuff. Go ahead. Ask for it by name. This entry was posted in Essential Dish, Uncategorized and tagged good life, Positivity. Bookmark the permalink.